With a bit of heavenly irony no Hollywood screenwriter would dare to write, longtime Notre Dame president, Reverend Theodore M. Hesburgh, died yesterday, one day after his old friend (and opponent) Charlie Rice. But whereas both Rice and Hesburgh would say they loved Notre Dame, Rice (as my article indicates) was on the right side of righteousness and the real way to educate a student to become a faithful Catholic, while Hesburgh was way in the wrong. For as author of the blasphemous and disastrous Land O'Lakes statement, which severed the eternal tie between Notre Dame and Rome, Hesburgh endangered the souls of thousands of his students, and quite possibly his own. 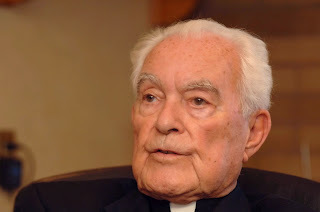 Certainly, many other articles and obits will fawn over his prodigious political fame and numerous academic achievements, but FIT must first and foremost concentrate on the fact that Hesburgh's many mistakes regarding the faith were not mere foibles. Therefore, we implore both the many who loved Fr. Ted and the few who were scandalized by him to now pray for his eternal soul — as Rice no doubt already is.